We had a great response from our article last week about how the Senate is divided after a double dissolution election. Something that keeps coming up in the comments on our social media pages is the question of why we even have a Senate, with many stating that we should abolish the Senate. And just last week a poll taken on the Alan Jones’ radio program found that 93% of respondents would support a referendum to get rid of the Senate? So this week we are going to explore the reason why we have a Senate, what the writers of our Constitution were thinking at the time when they created our Senate and whether the growing discussions concerning the possibility of getting rid of it have any validity. Why do we have a Senate? Our country, the Commonwealth of Australia, is a federation. What this means is that in 1901 the six colonies that made up Australia joined together to become one country. Each colony became a state at federation. Practicality it was federalism of nothing. The Australian colonies, who traditionally displayed all the cooperative tendencies of scorpions, would never have agreed to any closer form of union….Just as the founders knew a united Australia had to be a federation, so they were convinced that a federation was a good thing for a united Australia to be. The framework of our federation and our Constitution was negotiated over a period of about a decade. And it was always assumed that our system of government would consist of two houses. One for the States and one for the people. How the Senate would function, its powers and role in our democracy were nutted out in the Constitutional Conventions of the 1890’s. The Senate became the States house. Each of the States were given six Senate seats, with a guarantee that when the Senate was increased that each original state would have an equal number of senators. We now have 12 Senators for each State and legislation has been created to give each of the internal Territories two Senators. The Senate is an important aspect of our system of Government and the separation of powers principle that underlies it. We have an Executive, which is the Government (the Coalition at the moment), we have the Parliament (the House of Representatives and the Senate) and we have the Judiciary, each a separate power that has a check on each of the others. If we were to remove the Senate, the power balance would be altered. Let’s have a look at one State of Australia that doesn’t have an upper house. The Queensland Legislative Council was abolished in 1922. This upper house was a fully nominated body that consisted of members that were mostly conservative. Queensland Labor thought the house was undemocratic and as they described it: full of wealthy toffs who were often absent. When Labor gained a majority in the Lower House in 1915 they set about abolishing the Upper House. In order to do this the Labor party had to appoint a majority of Labor members to the upper house who then voted to abolish themselves. So let’s break that down and see how we would feel about that today. The upper house is being obstructionist to a new government that controls the lower house. The lower house has the power to appoint members to the upper house. Which they do. Once the party that hold the power in the lower house also has a majority in the upper house, they vote to abolish themselves. One house with so much power over the other house that they can get rid of it. But, is Queensland democracy better with only one house of parliament. How has this worked out for them since 1922? It has been argued that the excesses of the Bjelke-Petersen years might have been avoided if Queensland had an upper house to review legislation. And only a few years ago the Newman Government might have avoided some purported legislative blunders if there was an upper house. A number of pieces of legislation during that period had to be returned to the parliament after it had already been implemented because of defects in the legislation. An upper house would have been able to review this legislation and had the time to pick up these defects prior to the legislation becoming the law of the land. Which takes us to something you might have heard before and back to the federal Government…. Legislation is mainly introduced in the House of Representatives, where it normally quickly passes. The reason is that most legislation is written by the executive government, who control the House of Representatives and they have the numbers to wave through their legislation. Once it passes the house, the legislation is then introduced into the Senate and it is here that the legislation is scrutinised and examined in detail. Legislation can be sent off to a Senate Committee who will take submissions on it. They’ll hold committee hearings where experts give their advice on the legislation and reports will be written with all the findings. Committees will generally have Senators from a mixture of parties and it’s here that the rough edges and defects can be removed from legislation. There is also lively debate held on the floor of the Senate about legislation. But the Senate can also block legislation. If governments cannot always get their legislation through Parliament because of the Senate’s veto, this is the result of Australia’s design as a federation with a parliamentary government. It is a type of power-sharing arrangement. Australians intrinsically understand this veto power and as such many vote strategically. A person might vote for a major party candidate in the House of Representatives, but they don’t trust the party enough to give them their Senate vote. They expect the Senate to be able to protect them from the excesses of the Executive. Now, there is another side to this. Those Australians that do vote for the elected party in the House and the Senate are mightily disappointed (apoplectic is probably more apt) when the Government are not able to get their legislation through the Senate. This is when you start to hear about respecting government mandates. So a mandate is the authority given by the electorate to a candidate or a party. Does this mean candidates who gain a place in the Senate are also given a mandate? Or is it just the party that wins government by gaining a majority in the House of Representatives that should have a mandate? If you ask any independent Senator they’ll tell you they have a mandate too. The Constitution doesn’t use the word mandate at all. And just this week, both the Government and the Opposition have been asking the voters to give them a mandate in the Senate. Which must be an acknowledgement of the power of the Senate. Could we abolish the Senate? 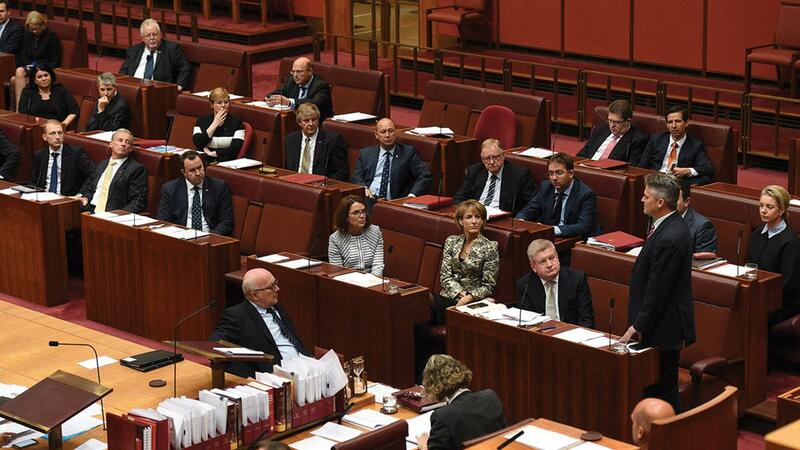 Would Australia have been a better place if we’d never had a Senate? If we removed the Senate now we would significantly alter our System of Government. The party that has the most members in the House of Representative is our Executive. Would our democracy be improved if we had an Executive that controlled the Parliament? Or is it better in the current situation where negotiation with the Senate is required for legislation to pass? The Senate takes up the entire Part II of Chapter I (plus other bits and pieces) of our Constitution and to remove all these section would require a referendum which would have to be conducted in accordance to section 128 of the Constitution. The first step of a referendum is for the two house of parliament to pass legislation for the proposed changes for the alteration. This means that an absolute majority of Senators would have to pass legislation asking the electors to abolish their role. Then for the referendum to pass we would need more than half the total number of electors in Australia to vote yes, plus a majority in at least four of the six States.